Turmeric is a popular spice used in South Asia for both culinary and religious purposes. It has also been used in traditional Indian medicine called Ayurveda. More recently curcumin has been identified to be the active ingredient in turmeric, and its pharmacological basis has been identified. This paper examines the extraction, processing and refinement of curcumin with special emphasis on testing and characterization. This study focuses on the comparison of UV Spectrophotometry and High Performance Liquid Chromatography (HPLC) for characterizing the purity of curcumin with the goal of selecting the best technique for this particular commercial application. Field application was a key criterion in the selection. Based on the results, HPLC was selected as the technique of choice for curcumin characterization application due to various factors such as accuracy of results, low cost, ease of use in the field, simplicity of sample preparation, robustness, quality and reliability. Turmeric is a popular spice that is commonly used in India and South Asia. It gives the ‘yellow-orange’ color to curry. In addition to its culinary use, turmeric has been widely used for various purposes in India since time immemorial. In Indian homes, turmeric has been widely used – in cosmetics, as a dye, as a food preservative, as an anti-inflammatory, as a disinfectant, as a depilatory, as a balm to prevent swelling, as a remedy for colds and coughs etc. In Indian temples, turmeric is considered very auspicious to the mother goddess. Finally, related to the topic of this paper – turmeric is used extensively in traditional Indian medicine or Ayurveda. Ayurveda, the ancient Indian medicine system is now widely recognized today as an effective, alternate and complementary medicine. The word Ayurveda in Sanskrit (an ancient Indian language) can be broken up into two parts - Ayus meaning "life", and Veda meaning "science," Ayurveda literally translated is the ‘science of life’. Ayurveda entails not only the therapeutic aspects of life, but also takes external parameters into effect such as seasons, climate, plant potency, and daily routine. Historical references of Ayurveda predate around two thousand years ago. The science and practice of Ayurveda was codified around 2,300 years ago by two men: Charaka and Susruta. Their respective treatises – Charaka Samhita and Susruta Samhita dealt with General medicine and surgery respectively. While there have been many subsequent treatises on Ayurveda, these were the first ones. It is based on these references that modern Ayurvedic doctors perform their duties as physicians. Plant based medicine is one of the central pillars of Ayurveda. Turmeric has been widely used in Ayurvedic prescriptions as treatment for a wide variety of diseases and conditions, including skin, pulmonary, gastrointestinal systems, aches, pains, wounds, sprains, and liver disorders ((Aggarwal BB, Sundaram C, Malani N, Ichikawa H., Adv Exp Med Biol. 2007;595:1-75.)). Arthritis is a joint inflammation disorder that affects the lives of millions. Unfortunately, Western Medicine treats arthritis as a condition and cannot ‘cure’ it, but can only help with its management. Ayurvedic doctors have historically prescribed curcumin to their arthritic patients. Recently there has been a lot of research on the extraction and identification of active ingredients in traditional medicines, specifically to identify their pharmacological basis. Focus of this study was to evaluate typical characterization techniques for testing curcumin purity - UV Spectrophotometry and High Performance Liquid Chromatography (HPLC) with a view of identifying and selecting the best technique from a field lab deployment perspective. Scientists have shown that curcumin exhibits antioxidant, anti-inflammatory, antiviral, antibacterial, antifungal properties – this is line with its use as a disinfectant by the ancients. More recently scientists have studied its anticancer activities as well as its benefits to chronic conditions such as diabetes, allergies, arthritis, and Alzheimer's diseases. Curcumin provides anti-inflammatory effects by preventing the formation of enzymes and cytokines that in turn drive the expression of inflammatory factors. Given the critical role of inflammation in most chronic diseases, curcumin holds a lot of promise for the treatment of neoplastic, neurological, cardiovascular, pulmonary and metabolic diseases. The pharmacodynamics and pharmacokinetics of curcumin have been examined in animals and in humans recently by Aggarwal, et.al ((Aggarwal BB, Sundaram C, Malani N, Ichikawa H., Adv Exp Med Biol. 2007;595:1-75.)) ((Menon VP, Sudheer AR., Adv Exp Med Biol. 2007;595:105-25)) ((Aggarwal BB, Harikumar KB., Int J Biochem Cell Biol. 2009 Jan;41(1):40-59. Epub 2008 Jul 9)) ((Chainani-Wu N., J Altern Complement Med. 2003 Feb;9(1):161-8)). What is Turmeric? Turmeric is the rhizome or the underground stem of the curcuma longa plant, a member of the ginger family, Zingaberaceae. The rhizome which is similar to ginger in that it is rough, is finger like with dark brown scales, is however smaller than ginger. It has a dull orange internal flesh. The rhizome is directly used in certain ayurvedic preparations in the form of a paste. The most common usage involves drying the rhizome and then grinding into dry powder to form the familiar ‘curry powder’. Turmeric, the curcumin plant, is a tropical plant, grown in South Asian regions. The plant is long, (about a meter in length), and its flowers are white and long. The rhizome of the plant is a maximum of 2 cm long, and a maximum of 7.5 cm in width. The city of Nizamabad in the South Indian state of Andhra Pradesh is popularly called ‘Turmeric City’ because of the abundance of this cash crop. Turmeric is planted with the first monsoon rains, and it takes approximately 8-10 months to mature ((Author unknown. Consumer’s guide to Curcumin and Turmeric, Healthy Source. http://curcumin-turmeric.net/)). Even though many ancient medical treatments are generally safe, historically they have been ignored by western medical research due to the researchers’ inability to identify their active ingredient(s) as well as its molecular target(s). Turmeric is a notable exception. The key ingredient of turmeric, called curcumin, which gives turmeric its characteristic yellow color, was first isolated over a century ago. That isolation was limited to the identification of the ingredient that gives turmeric its characteristic color in connection with its use as a coloring agent. In the past two decades, extensive research has successfully identified curcumin to be the active ingredient in turmeric that provides its anti-inflammatory properties. Identification of active ingredients was crucial as it paved the way for formulating potent medications that can be distributed through a traditional pharma model. The structures of the curcumin and curcuminoids were determined in 1910 to be diferuloylmethanes ((Aggarwal BB, Sundaram C, Malani N, Ichikawa H., Adv Exp Med Biol. 2007;595:1-75.)) ((J. Milobedzka, St. v. Kostanecki, V. Lampe (1910). "Zur Kenntnis des Curcumins". Berichte der deutschen chemischen Gesellschaft 43 (2): 2163–2170. doi:10.1002/cber.191004302168. )), pictured in Figure 2 ((Author unknown. Consumer’s guide to Curcumin and Turmeric, Healthy Source. http://curcumin-turmeric.net/)). Curcumin, or curcumin 1, has a molecular formula of C21H20O6. 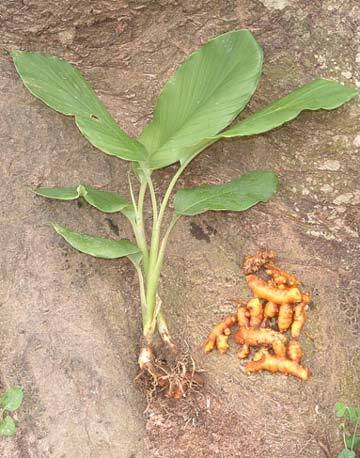 The rhizome of the curcuma longa plant, turmeric, is dried in the sun, then powdered and shipped for common uses. Higher quality turmeric powder is sent to labs for purification and refinement to extract pure curcumin (usually 95% purity), which is what is prescribed by Ayurvedic doctors. Figure 3 shows a photograph of the turmeric rhizome as well as the curcumin that was extracted as part of this study. Curcumin composes only 4% of the turmeric rhizome, therefore necessitating the need for highly precise refinement processes. Typically commercial refinement processes lead to 90-95% purity. In this section the refinement processes used in this study are outlined. Filtration is the first step in the refinement of curcumin. In this process, turmeric powder is converted into a mixture called the Oleoresin. Ethylene dichloride (EDC or C2H4Cl2) was used as a solvent to dissolve impurities. EDC was added to the turmeric powder in the ratio of 3 ml/gm of turmeric powder. 300 ml of ethylene dichloride was added to 100 g of turmeric powder in steady and equal increments and mixed. The resulting mixture was heated to 60C, and stirred using an automatic stirrer for 1 hour. After an hour, the mixture was cooled, the leftover solvent was decanted, and the extract was filtered into another beaker. The same process was repeated twice, the EDC extracts were collected, and the leftover solvent was decanted away. The filtration process removes impurities from the turmeric. The mixture of EDC and turmeric paste is the oleoresin. 100 g of turmeric powder yielded 25.2 g of Oleoresin. The remaining impurities were filtered out in this process. The process was repeated again with the 19.2 ml of alcohol. The filter paper/cloth was placed in the flask, and again in small equal amounts the alcohol was poured in. Finally the filter cloth and its contents (pure curcumin) were dried in a hot air oven at 60C for 1 hour. After an hour, the filter cloth and the contents was weighed to be 5.9705 g (weight of the dry curcumin). The mass of the filter cloth, 1.1311 g, was subtracted from the total mass, to get a mass of contents/ curcumin equal to 4.84 g with significant figures. It was found that the 25.2 g oleoresin provided only 4.84 g of curcumin. From 100 g of turmeric powder we yielded 4.84 g of pure curcumin, corresponding to 5%. The numbers were in line with typical extraction at Katra Phytochem. Typically, raw turmeric contains 3-10% curcumin, the oleoresin contains 25-30% curcumin, and the curcumin sample that is refined contains 90-98% pure curcumin. Purity testing procedures are key as they help to optimize processing procedures as well as to identify the quality of turmeric. Locating characterization labs near the growers enables the growers to optimize turmeric to yield in the field. In this study, two test techniques commonly used for characterizing curcumin were employed, Spectrophotometry and Chromatography. One of the major goals of this analysis following the research/experiment was to compare these two commonly used techniques specifically for curcumin characterization from a field application perspective. Various factors were identified for this comparison. Spectrophotometry is an analysis technique that involves the measurement of the amount of light absorbed by a sample material as a function of wavelength. Greater the concentration of the substance in the solution, greater will be the absorbtion. Thus, by measuring the amount of light absorbed one can calculate the purity of sample through the use of calibrated references. In this study, a Shimadzu PharmaSpec UV-1700 spectrophotometer with an ultra-violet/visible (UV/Vis) source was used. A good solvent like acetone was used as a reference. Three reference solutions of different ratios of Acetone to water were prepared – baseline (1:1), diluted (1:39) and highly diluted (1:800) for the analysis. A sample of curcumin that needed to be analyzed was weighed to be 0.1078 g. The curcumin sample was added to the sample cuvette along with acetone solution. The two were mixed together using a very small stirring rod. The spectrophotometer was turned on and measurements were obtained as shown in Figure 5. The following formula was used to calculate percent purity. Where ABS is the absorbtion peak from the spectrophotometer data, Vo is the volume of the acetone solution, V1d is the volume of the first diluted acetone solution, V2d is the volume of the highly [second] diluted acetone solution, C is the curcumin factor, 1710, Vac1 is the volume of acetone in the first cuvette, Vac2 is the volume of the curcumin acetone mixture in the second cuvette, and Mc is the mass of the analyzed curcumin. Percent Purity Calculation: Results obtained from the spectrophotometer are shown in Figure 5. The Absorbtion peak was measured to be 0.439 at a wavelength of 419.8 nm. The values for V0, V1d, V2d, Vac1, and Vac2, were 100mL, 100mL, 100mL, 5mL, and 5mL respectively. The value for C was 1710 and the value for Mc was 0.1078 g.
Purity of the curcumin sample was estimated to be 95.26% as measured through spectrophotometry. The procedure was repeated with two more samples. Results are shown in table 2. Chromatography is a technique to separate molecules/compounds physically, where the components to be separated are distributed between two phases. There are many types of chromatography: column, liquid, gas, paper, etc. In chromatography, three solvents are used to separate the components of compounds. The solvents can be high polar, mid polar, or non polar. High polar solvents include water, methanol, and ethanol. Mid polar solvents include ethyl acetate, acetone, and chloroform. Non polar solvents include hexane and petroleum ether. High performance liquid chromatography, or HPLC, was used to test the purity of the curcumin sample. A Shimadzu HPLC machine was used for the analysis. Peak number 4 on the data graph is clearly the highest peak that corresponds to curcumin. The area % of this peak was calculated by the instrument to be 94.58% and represents percent purity of the sample. The procedure was repeated with two more samples. Results are shown in table 2. It was noted that the percentage purities measured using the two techniques differ. For the first sample, results from the spectrophotometer indicated a purity 95.26%, while that from the chromatogram was 94.58%. Results from the three samples are shown in Table 1. The two measurements were quite close to each other and the differences can be attributed to measurement uncertainty. The results have clearly shown that HPLC measurements were in line with the spectrophotometry. The spectrophotometry technique required fairly sophisticated and expensive instrumentation, elaborate reference solution preparation methods, data interpretation and additional calculations to estimate purity. Spectrophotometry conserved time, but in contrast HPLC was much easier to use. Speed is not a major advantage in this particular application. The sample preparation for HPLC was very simple. HPLC equipment in general was lower cost compared to spectrophotometry. It was also easier to train test personnel on HPLC equipment than spectrophotometry providing greater efficiency. One of the criteria for consideration was field operation – HPLC equipment was deemed to be more suitable for remote field labs for use by technicians with limited qualifications. Given the results from the two techniques were comparable, this study concluded that the HPLC owing to the reasons stated above was the technique of choice for curcumin characterization from a field application lab perspective. The widespread use of Turmeric was examined, specifically related to medical treatments in traditional Indian medicine. The active ingredient of turmeric was reported along with its pharmacological basis. The chemical extraction was reported on, additionally the processing and refinement of curcumin with special emphasis on testing and characterization of purity was reported. Specifically UV spectrophotometry and High Performance Liquid Chromatography (HPLC) have been compared for the characterization of sample purity. It was shown that while both methods yield comparable results. 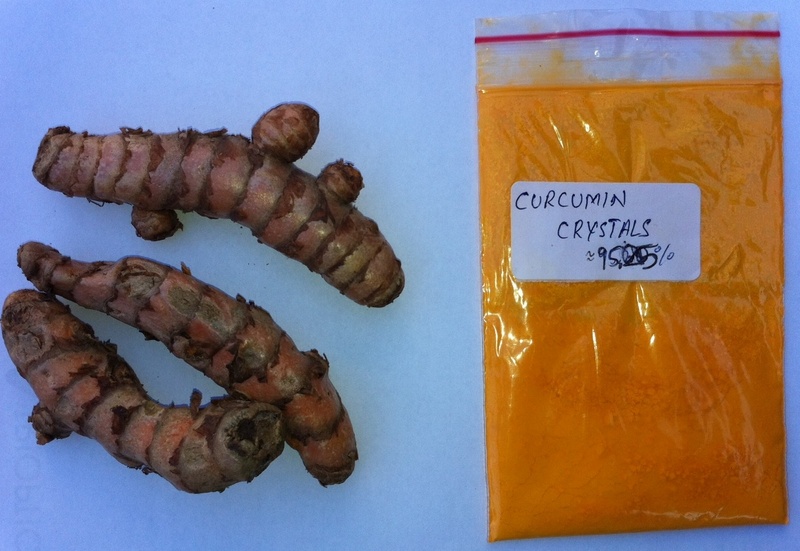 HPLC was selected to be the technique of choice for the characterization of curcumin owing to its low cost, ease of operation and lack of elaborate sample preparation procedures. The author would like to acknowledge Ramesh Vangal, CEO of Katra Phytochem (India) for gracious support of this work and Priya Ramesh, GM R&D, for technical guidance and support. Tell us a little about yourself (hobbies, interests, etc). Keshav S. Thvar is a sophomore at Mountain View High School, Mountain View, California. Keshav's love for Math and Science began in his early years. He has enrolled and successfully completed multiple advanced courses in Science and Math including AP Calculus, AP Physics, Honors Chemistry. In his freshman year Keshav won the Science Award from Mountain View High School for Outstanding Achievement in Chemistry Honors. Keshav strongly believes in the upliftment of underprivileged children. He is the President of the Teen Outreach Project. Recently, Keshav spent 2 weeks as an international volunteer teaching and helping indigeneous children in the Centro Educativo Bilingue Ixmukane at Tecpan, Guatemala. Keshav is an accomplished Flutist. He also plays badminton and enjoys swimming. Arthritis is a joint inflammation disease, which impacts the lives of 46 million Americans. My great grandfather and my grandfather have been among those affected by arthritis. During my visit to India last summer, I saw my grandfather ingest a spoon of a yellow powder along with his milk. This incident sparked my curiosity, so I asked him what it was. He replied that it was curcumin, an ingredient in turmeric, which his physician had prescribed to him. This stoked my interest. I later decided that it was important for me to figure out the reason for him to eat the powder; in other words, to figure out the benefits of curcumin. I also wondered how chemists had extracted this ingredient, curcumin. Over the summer, I went to Bangalore to find out more about the process. My journey first took me to AyurvedaGram, an Ayurvedic healing center, where I found that the active ingredient in turmeric was curcumin. During my visit there, I learned of Ayurveda, a newly revived ancient Indian complementary medicine, and the various benefits of turmeric. I also learned that the AyurvedaGram physicians source their curcumin from the Katra Group. Then, I wrote a letter to the CEO of the Katra Group, told him of my strong interest in Curcumin and asked if I I could explore more about the turmeric-curcumin conversion process. He was intrigued by the request and my strong interest. He invited me to visit them and learn about Curcumin but also offered me the opportunity as an understudy/intern in the Katra Phytochemistry Labs, not only extract curcumin from turmeric but also help them perform various data analyses to test the purity of the samples. During my time at Katra Phytochemistry Labs, I was helping with a project focused on purity characterization techniques, specifically on both spectrophotometry as well as High Pressure Liquid Chromatography. During the course of my work I compared the two techniques from a practical field application standpoint. That became the focus on my work. How were you able to find a mentor? Alternatively, if you completed the project on your own, how did you manage to do that? I contacted the CEO of Katra Phytochem with my interest in learning more about curcumin and its extraction/processing. Impressed with my interest in such an early age, he not only directed me to their phytochemical facility in Bangalore, India, but he also offered me the opportunity to spend time with them as an understudy/intern. I was able to both learn about curcumin as well as help Katra in the area of choosing analysis techniques for field use. Ms. Priya Ramesh, head of R&D at Katra helped me and served as my mentor for this project. What were some challenges you faced, and how did you resolve them? It was a little difficult to do research on the history and pharmacology of curcumin, but I managed to take some notes and come up with the highlights of several clinical studies. The analytical techniques especially for characterization of curcumin required a lot of diligence and careful control of experiments. Initially that was a challenge but later I was able to recognize the importance of experimental protocols which I followed completely. What resources did you find were helpful during your research process? I found that the PubMed site was extremely helpful in looking up information about the pharmacology of curcumin. Also, the people at Katra Phytochem were extremely helpful in indicating what resources I should plan on using. Discussions with key researchers at Katra and their partners were also very valuable. What did you like the most about your research? The most exciting part of the research was performing hands on experiments in the lab and working on a 'real world' project with a practical application. In this case comparing two analytical techniques and choosing one that was most suited to a particular application. Any advice for other high school researchers? It is most important to find a topic that interests you. Once you find it you should pursue it with no stone unturned. Sir can you please describe the process of UV Spectrophotometry. How many cuvettes were taken at a time for analysis ? Solution of curcumin was prepared by acetone with or without dilution?How was the Purity formula for Spectrophotometry derived?